This post is sponsored by Petfinder, but Catladyland only shares information we think would be of interest to our readers. The opinions are our own. 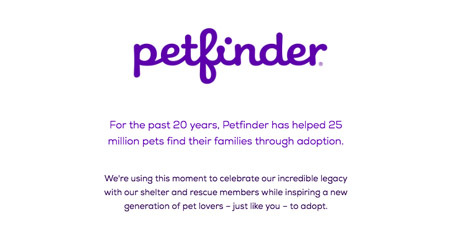 Pet adoption transforms lives, and Petfinder's celebrating their 20th year being a huge player in that transformation. In fact, more than 20 million pets and parents can claim they met their destiny on Petfinder.com -- that's an average of 1.2 million per year! Amazing, right? Saffy (R.I.P) was adopted from a shelter, and Phoebe and Cosmo came to us unexpectedly by way of friends a year or more after Saffy's adoption. When we first considered adding a kitty to our family, we immediately knew to go to our local shelter. It's really true what they say about you and your pet "choosing one another." It's not at all like grocery shopping -- there's an intuitive, emotional component. You know and the pet knows when it's meant to be, and that's exactly how it happened with Saffy. When I saw her for the first time, my heart skipped a beat. Then she looked at me with those bright green eyes and it was like we recognized one another: Finally, here you are -- I've been waiting. You can't adequately explain it unless you've experienced it. Saffy went on to teach our family about patience, caring for a senior kitty, and the gentle nuances of grieving the loss of a beloved pet when she passed away just this summer at age 15. 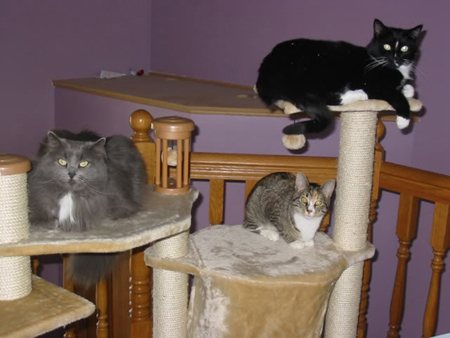 Saffy, Phoebe, and Cosmo (L-R). For the last two decades, Petfinder has been committed to facilitating these powerful connection experiences. To celebrate its anniversary, they're asking pet parents, pet lovers, and pet advocates to join the celebration and their effort to donate $200,000 benefitting 20 shelters and rescue members. It's not hard at all! All Perfinder wants is to generate one million views of its #MetOnPefinder video by October 24. And the video is one you'll want to see because it shows how pets have transformed the lives of their adopters. When the one million views are met, 20 shelters will each receive a $10,000 grant from the Petfinder Foundation to help continue their good work. 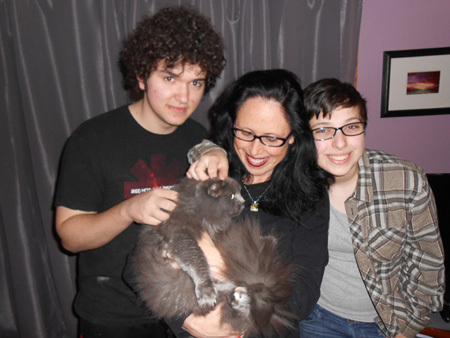 My kids and I lovin' on Miss Saffy. Please watch the video, but Petfinder also encourages families, advocates, and partners to share their Petfinder adoption stories on social media using the hashtag #MetOnPetfinder. Speaking of the video, you don't have to go far to watch it ... here it is! Thank you for your part in helping transform the lives of pets and the families who adopt them.